You “have been borne by me from before your birth, carried from the womb; even to your old age I am he, and to gray hairs I will carry you. I have made, and I will bear; I will carry and will save” (Isaiah 46:3b-4). If you are traveling in southern Minnesota just southeast of Rochester near the towns of Wykoff and Spring Valley, you are likely to see the Root River. It’s in this picturesque locale that the Root River Life Chapter had its beginnings in 1987. Helen Keyes, its founder, had worked in the life arena for several years prior. She wanted to continue her life-affirming work in connection with her Lutheran heritage, so it became natural to organize an LFL Life Chapter. It began at St. John’s Lutheran Church in Wykoff. Helen’s husband, Donald, served as treasurer for many years. The Keyeses often hosted chapter meetings in their home until 2018 when they retired from the Life Chapter at the ages of 93 and 97. The Lord recently called Donald Keyes to his eternal home in June of this year. It goes without saying that these two champions For Life made supporting the sanctity of life their personal life’s mission. I had the pleasure of being in southern Minnesota a few months back and attending the Root River Life Chapter meeting being held in Spring Valley at the home of Fred and Dorothy Mundfrom. Dorothy (83) serves as the current secretary, and Fred (89) is a former president of the group. It was an inspirational experience for me as I listened to this small but enthusiastic group talk about their upcoming events and previous life-affirming work they have sponsored. They spoke affectionately of Helen and Donald Keyes and the example they had set for them. 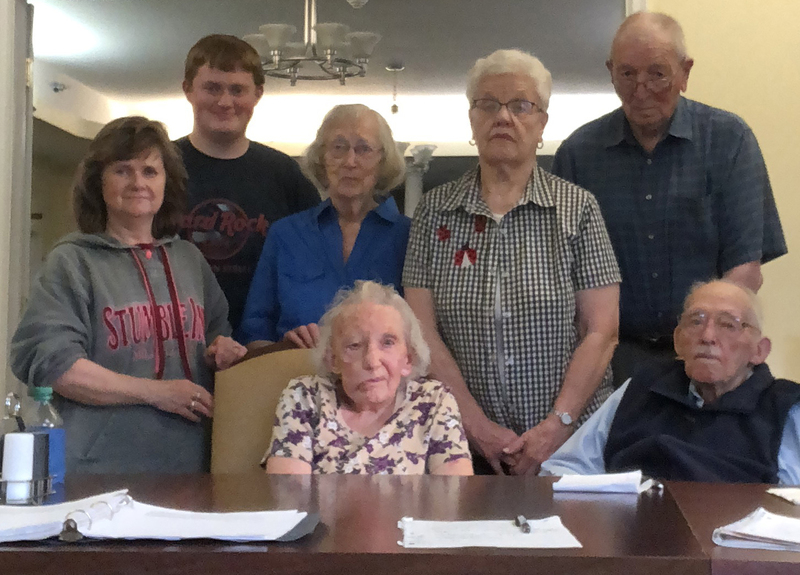 I was also fortunate to meet Donna Erdman, who, at the age of 91, is still active in coming up with new ways to serve the Lord as a team and keeps their activities in the local newspaper as a witness to the community. The Root River Life Chapter has hosted numerous events in their 31 years, including marching in various parades in their local communities, manning booths at local fairs, attending national gatherings, sponsoring baked goods and rummage sales (with the help of St. John’s members), and collecting baby items from Mother’s Day through Father’s Day for the pregnancy center in Rochester—just to name a few. I was surprised to find that their current president, Collin Hofschulte, took on the position in 2015 when he was merely 15 years old. He is passionate to serve the Lord and promote the sanctity of human life. His mother, Susan Hofschulte (60), a daycare provider, is also a member and provides the final blend of ages that makes up this inspirational group. Collin, who is currently 18, is a true example of the life-affirming youth of today. As part of a college-in-school political science class, Collin was required to pick a major court case to debate. He chose Roe v Wade. His professor was an extreme liberal, so Collin was apprehensive, yet took on the project with confidence. He wasn’t allowed to show descriptive pictures, so he chose to bring along a 12-week-old fetal model. During the debate, he managed to get his opponent to admit abortion is actually murder, which astonished the entire class. In his closing statement, he invited anyone claiming to still be pro-choice to come forward and slam a book on the fetal model to destroy it, like a real abortion would. Only two boys came forward. The first one dropped a book on the model, not destroying it. The second picked up the fetal model and said, “This is not the topic of the debate,” insisting the issue is a woman’s choice issue rather than a fetus. In the end, Collin received many congratulatory statements from classmates, affirming he made a convincing and truthful argument. His professor said he made a powerful closing statement and gave him a 4.0 grade for the class. The Lord was clearly working to help Collin that day. This fall, Collin will be entering the Mayo Clinic School of Health Sciences – Emergency Medicine Paramedic program. There is no doubt he will be a caring health professional, serving those in need. Clearly, Collin and the Root River Life Chapter continue to support life. Last year, they gave away fetal models and Life Savers® candies in a local parade. A pro-choice person wrote to the editor in the local paper saying that practice should be banned. A week later, a life-affirming supporter responded, thanking them for the gift and willingness to share their views. Their brave actions have certainly gotten noticed, and we thank them for that. May the Lord continue to inspire and bless the Root River Life Chapter in southeastern Minnesota as they share the message of life through their projects and personal witness because, as we know, God loves life!